Larry was disappointed to wake up and find he wasn't tucking into a giant slice of watermelon after all. "Who's nicked the bloody steering wheel?" "I learned this from Miley." "Arghh, my tongue's caught in my Air Bullworker." 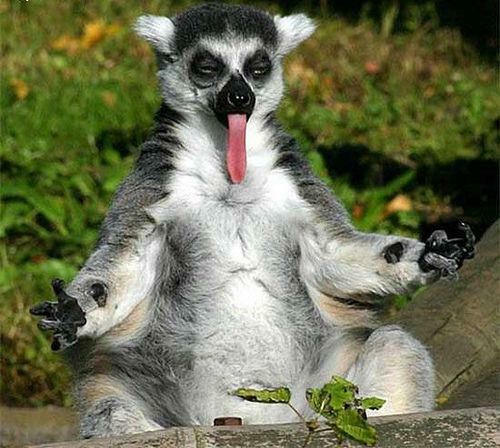 In a New Zealand zoo a Lemur performs the Haka . His wife dropped a Boo Boo she was meant to get him A Yogl bear story not a Yoga Bare book. The years were not kind to Gene Simmons. Hakka pakka in the night garden. More gin, anyone? I kid you not ladies, he was THIS big! But he got away from me. Despite the encouragment for everyone to 'All Rise' Lemar was feeling Blue. After a sell-out tour of Madagascar the Great Rafiki's influence on the natives was clear to see.